For beginners, you’ll need to attach both bungee cords on the ”OX” Backpack on each side of the student’s hips, which will make a “Y” connection. Pull on the right to make your student engage a left turn and vise versa. There is no need to use two ropes. You can also use the leash in front of the student using the same attachment points to practice toe side with your student (snowboarding) or towing your student if on skis. Just hook both bungee cords/clips to the Stainless “D” ring or one clip on the “D” ring and one on the “O” ring on one side of the bag (waist) and you’ll be able to control the speed of your student when practicing going straight downhill. Just hook both bungee cords/clips to the Stainless Steel “O” ring and you’ll be able to control their speed and also control their turns as the ring will travel from one side to the other. Speed is key when starting hitting small obstacles and the MDXONE ”OX” will help you control it with ease. 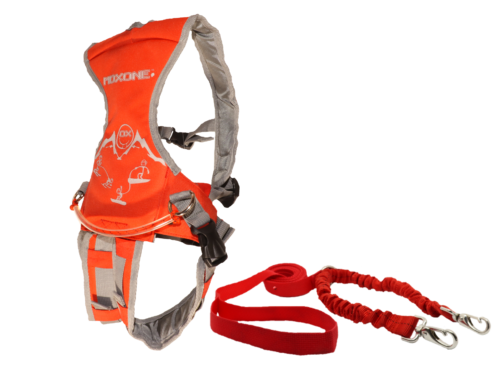 The MDXONE ”OX” is a small backpack/harness (10”H x 9”W x 2”D) with three attaching points for the leash. Two attachment points at the waist (one on each side of the hips). These attachment points are to be used with the “Y” connection for beginner. “Versatility” We got it ! The third attachment point is located on the unique webbing taped lanyard with a Stainless Steel ring. This attachment point is to be used when the student is at an intermediate / expert level. Both bungee clips need to be attached to the stainless steel ring. MDXONE ”OX” snowboard/ski harness can be used from 1-year-old all the way to 5 years old depending on the size of your child. “Adjustable straps” For sure ! The ”OX” backpack has chest and waist adjustable straps to prevent the bag to rise up. Each strap has an elastic pouch to securely store the extras, so you have no straps or cords sticking out which makes it safe when on the chair lift. The MDXONE ”OX” also has a removable “seat” harness which gives more support, especially for the little ones. You’ll also like the two grab handles. You’ll use them frequently when your little shredder is falling and also when you go on & off the chairlifts. These handles are extremely handy!!! It will take you 5 seconds to put the leash inside the bag at the bottom of the hill. ALWAYS fully disconnect the LEASH from the BACKPACK when going on/off chairlift. Store the leash in the backpack or keep it your hand (disconnected).